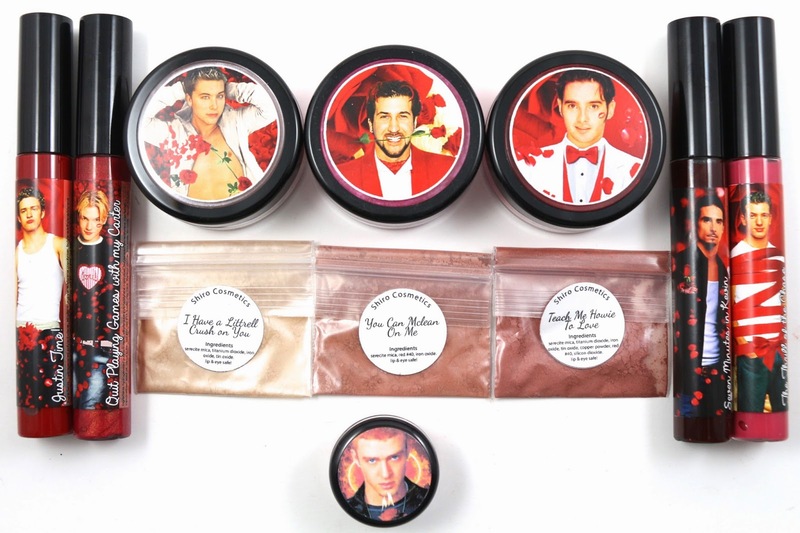 Shiro Cosmetics' Battle of the Boy Bands Collection is broken up into two parts, one for each of the two main popular boy bands of the '90's. I wanted to try everything, but was hesitant about the blushes from the I Want It That Way portion of the collection. I decided to only get those in samples, but everything else I went for full size! I even purchased the additional eyeshadow that was added for Valentine's Day. About - Shiro Cosmetics is an indie makeup company based out of Oregon, that focuses on geeky themed collections inspired by some of our favorite fandoms, including Pokemon, Game of Thrones, Avengers, and others. 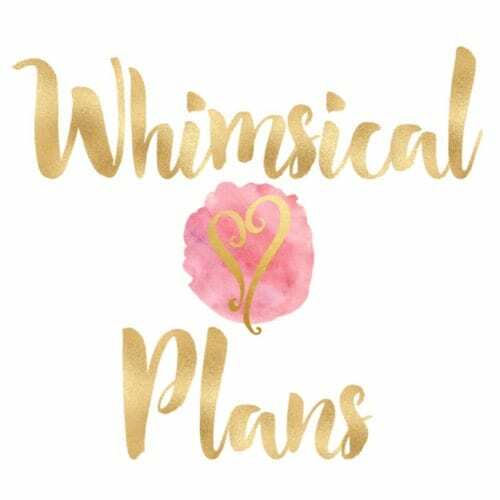 They offer sample bags, mini jars, and full size jars, and every month they have a color of the month that is voted on by their Facebook page fans. Shipping - I made a little mistake and did not order this the first day it released as I was still trying to decide what to get. But once I ordered, it shipped 20 days later via USPS, and arrived in 4 days from Oregon to California. Product Size - Every product except the eyeshadow is available in a sample or full size. The eyeshadow is full size only. 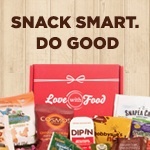 Free Samples - I always receive two free samples with every Shiro order. All blush/highlight swatches are done over bare skin and blended out. Eyeshadow swatch is done over Too Faced Shadow Insurance primer. 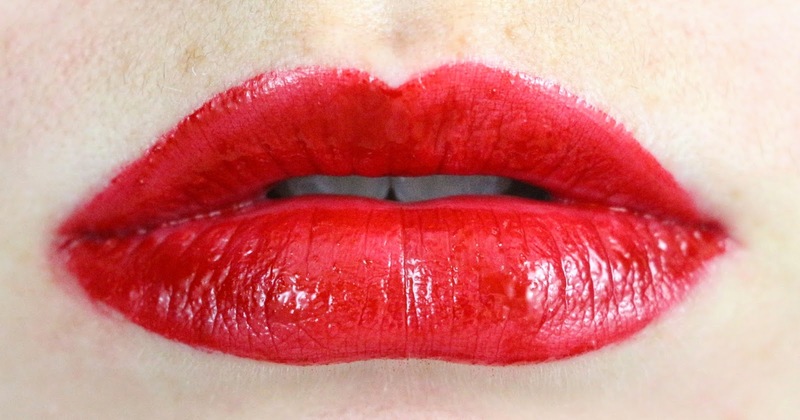 Lip swatches are done over bare lips. 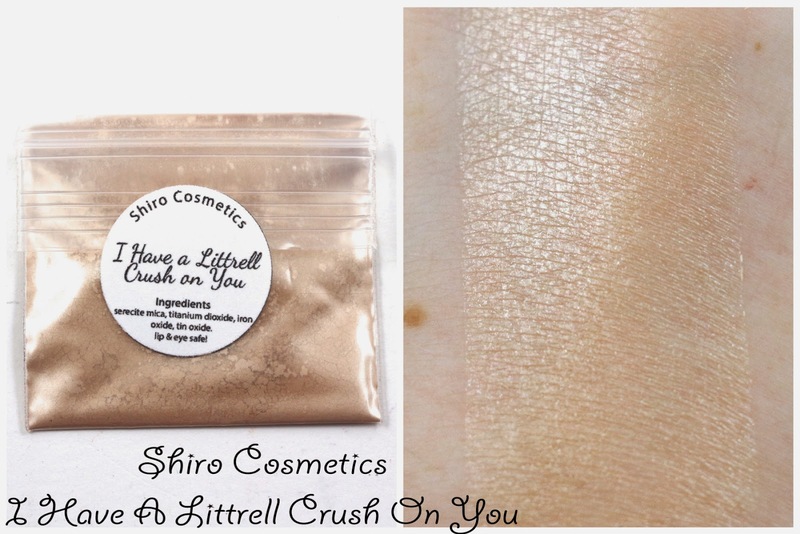 I Have A Littrell Crush On You - "Warm-toned highlight with the most subtle shimmer." This is a very yellowish golden highlight, with a bit of sheen. Not what I typically reach for in a highlighter, but pairs nicely with the warm tone of the rest of this mini collection. 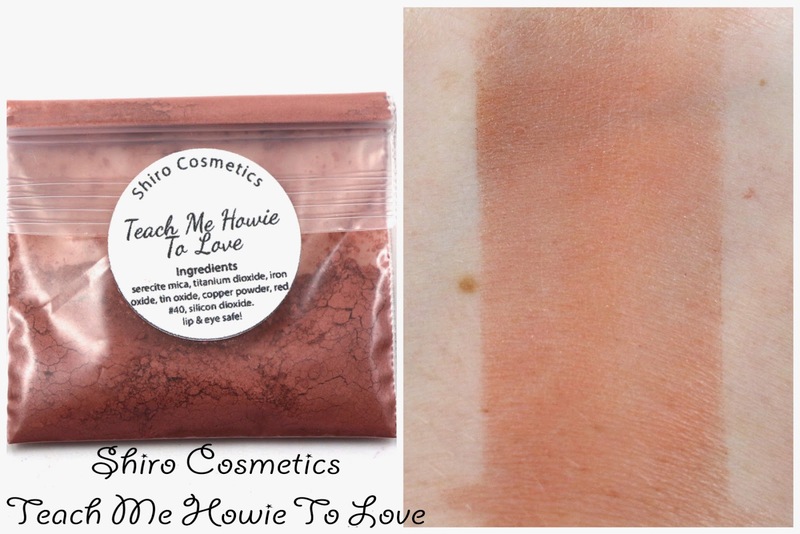 Teach Me Howie To Love - "Deep warm rose with barely-there shimmer." This shade is mostly the reason I only wanted to get these blushes in samples, I was afraid they would look too brown on my skin tone. And this one is a bit too dark. 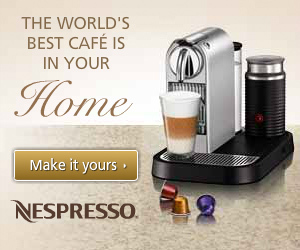 I have to be very careful not to use too much, and even then it leans brown on me more than a warm rose. 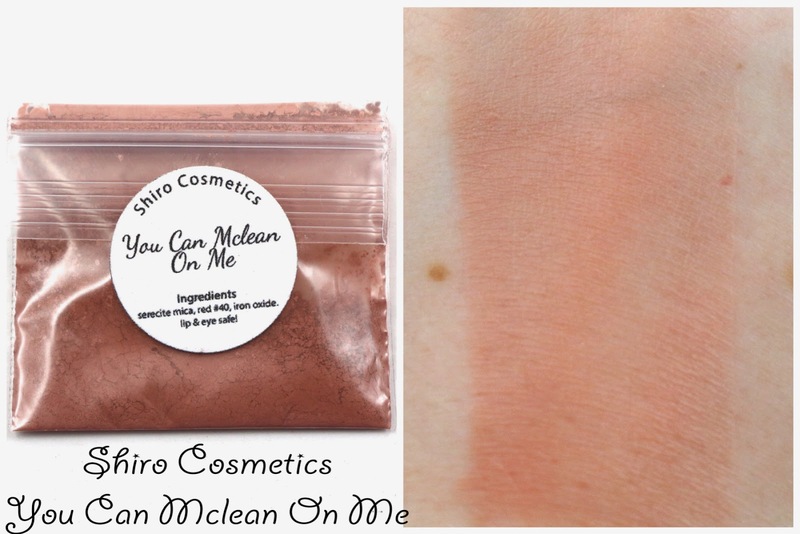 You Can McLean On Me - "Soft matte warm blushy beige." This one I liked more than I anticipated, it looks a little brown in the bag, but it's a nice light peachy rose shade on my skin. And it applied nicely as well on my face. Quit Playing Games With My Carter - "Rich fuschia-toned pink gloss with a soft golden shimmer. Slightly more than moderate opacity." This one was a nice surprise, I expected it to look different based on the color in the tube. And you can see the golden shimmer pretty well. I like it, very bright and colorful, and the easiest to get even. Seven Minutes In Kevin - "Deep Dragon-styled red in a wearably moderate opacity." This one is slightly brown red, almost blood red. I like the opacity on this, any more and it would be very difficult to apply perfectly. 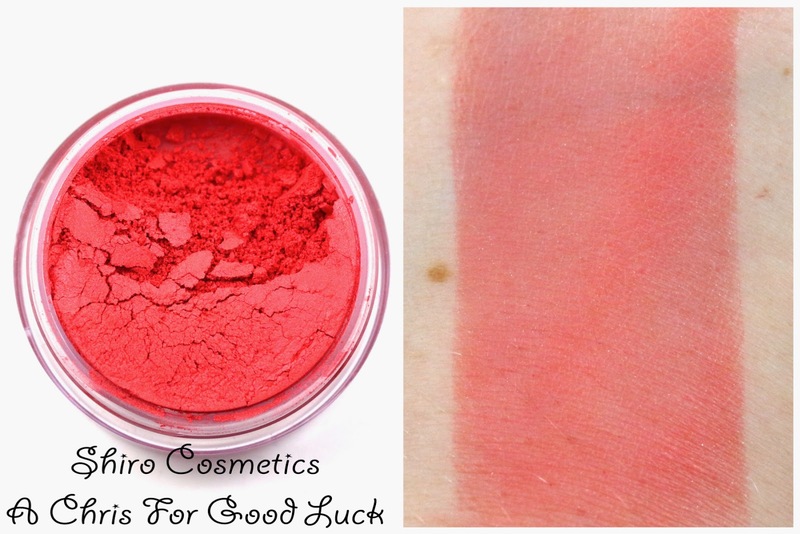 A Chris For Good Luck - "Bright mid-toned matte red!" With a light hand, this would look very nice on my skin. It's bright, bright red though, so proceed with caution! I am glad it's matte though, with no shimmer. Crazy For You - "A color-shifting shadow which rubs down from vibrant red-pink to a deeper maroon with whispers of gold." This was the eyeshadow that was added to the winning collection with the most sales by Valentine's Day. I've never really played with color-shifting shadows, so I didn't really see the shift. 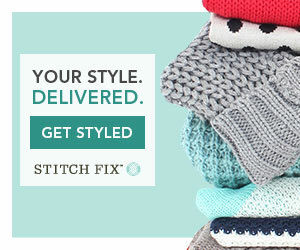 In my swatch though, it looks like a muted red with a golden sheen. I'll have to play around with it more to see what the color shift looks like. 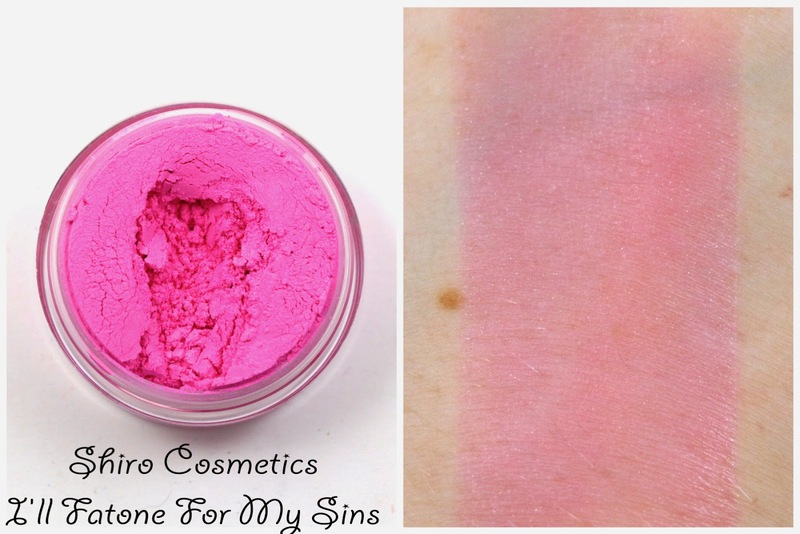 I'll Fatone For My Sins - "Ultra-vivid cool matte pink!" This blush is neon pink, and I was a little intimidated by it at first. 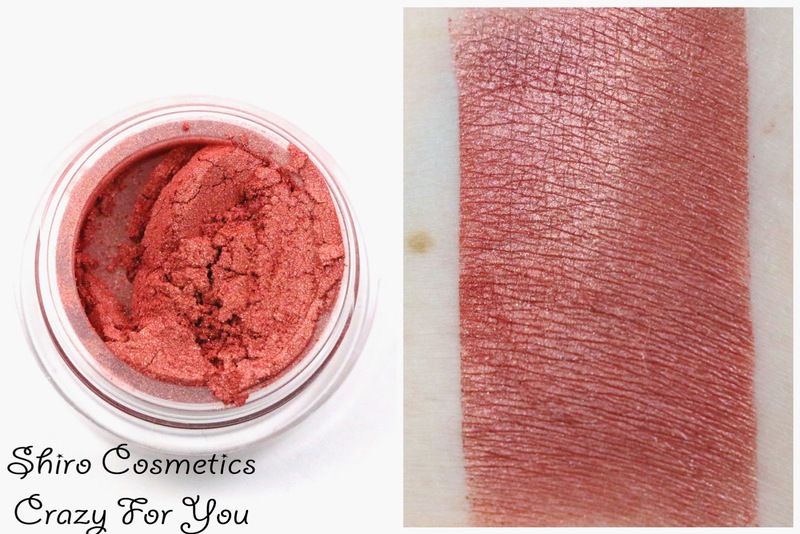 But blended out, it makes for a very lovely blush, especially great for spring and summer. I loved the look of it on my face as well, it worked nicely with my skin tone. And it was fairly easy to blend out too. 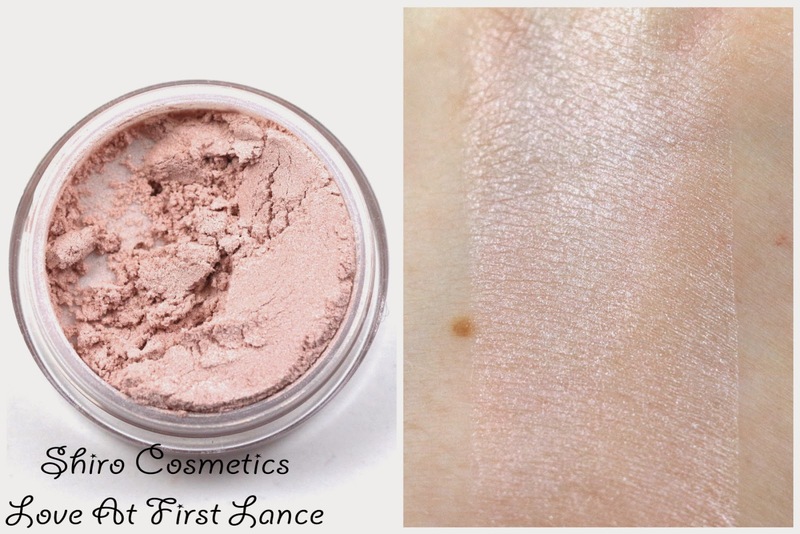 Love At First Lance - "Cool pink-toned lightly shimmery highlight." I like cool toned highlights the most, so that's why I went with the full size of this one instead of the golden one. I like using highlighters as my brow highlight as well, so if they can double duty, they are a winner in my book. This one isn't that distinctive, but it gives a lovely light pink shimmer. Justin Time - "The perfect warm ultra-opaque T-Swift polished red." This shade is very pigmented, and took quite a bit of work to get to look right. And in the mirror it looked nicer than it is zoomed in, so you'll probably want lip liner or a steady hand for this one. The Thrill of the Chasez - "Mid-toned sheer/moderate bubblegum pink!" This was probably my favorite out of all the lip glosses, because it's like a bright pink my lips but better. Going outside my lip lines with this one wasn't as harsh, because it's almost like a darker shade of my natural lip color, and slightly more pink. It's also a little sheer as well, so that helps too. The perfect shade for spring and Easter, which I'll probably be wearing a lot! Overall, I was pleasantly surprised by how much I liked this boy band collection. I'll be honest, I had a N'Sync CD when I was younger, but I didn't much care for them or the Backstreet Boys. I was more of a Spice Girls fan. But I think this collection is a great homage to our preteen crushes, and perfect for me because I need a break from eyeshadow. I have been on a blush and lip product kick lately, so I don't mind adding more of those to my collection. I think the only thing I might go back for full size that I got in a sample was You Can Mclean On Me, because that was my favorite shade from the I Want It That Way half. I think my favorites were Quit Playing Games With My Carter, I'll Fatone For My Sins, and The Thrill Of The Chasez. I wouldn't say everything is necessary from this collection, but at the very least it's worth getting some samples to try for yourself. Or if you're a fan of a certain member, you could get that one in full size for the artwork. Availability - All of these products are permanent, so they will continue to be available. Overall Satisfaction - My favorites were Quit Playing Games With My Carter, I'll Fatone For My Sins, and The Thrill Of The Chasez. Since everything is permanent, there's nothing wrong with getting sample sizes of a few things and trying before committing to a full size. But I'm happy with my choice to get most in full size, and the few warmer face products in samples. What did you think of the Shiro Cosmetics Battle of the Boy Bands Collection? Let me know in the comments!